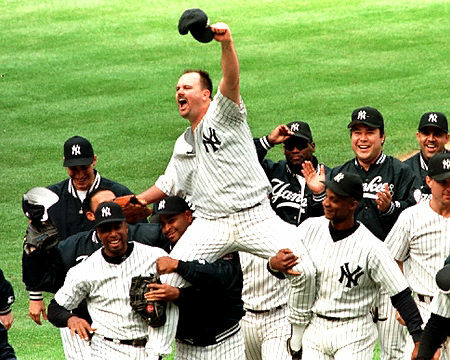 On May 17, 1998, Yankee pitcher, David Wells, did something no Yankee could do since 1956, pitch a perfect game. Throughout Wells’ career, he was a consistent pitcher, but never stood out as one of the best in the bigs. Day in and day out, he was a great pitcher to have in your rotation because he had fantastic control and a plus curveball. On this day, however, Wells was better than ever. He didn’t throw one bad pitch the entire game. Minnesota hitters knew the at bat was over before they got in the box. His breaking ball was absolute filth and his two-seamer was impossible to hit. And the best part about this game, Wells was hungover while he did it. This moment definitely gave the hint to Yankee fans that this season was going to be special. Yankee Stadium was already rockin’ and it was only May. What made this moment so outstanding is how it foreshadowed the Yanks’ greatest season of all time. This entry was posted on February 18, 2010 at 9:58 am and is filed under 5BS Greatest Sports Moments (since 1990), Yankees. You can follow any responses to this entry through the RSS 2.0 feed. You can leave a response, or trackback from your own site. You should add that you were there at the game –keeping score! you need to eat your words about Lindsey Vonn. The hype and reporting about her injury really made her win bigger and better –and I’m sure added viewers. It’s a lot to be said about someone who skis through pain –who is willing to reach for their dream despite the pain. After all –goals are not always easily reached and getting there can be painful –and more rewarding because of the pain! “And the best part about this game, Wells was hungover while he did it.” I believe you’re falling into the sportswriter’s trap of romanticizing lifestyle over performance. It may have been an interesting factoid but it was not by any stretch ‘the best part’ of the endeavor. The best part about the game was that it was BEANIE BABY DAY. Beanie power ruled the day. I’m surprised you didn’t make note of that.